Discussion in 'Introduce Yourself' started by shan1203, Aug 2, 2017. Last year, my wife received an orchid as a gift from her team at work. She kept it in her office for some time and unsurprisingly, it was not doing well in an office environment. She brought it home and asked if I could bring it back to health. At the time she brought it home, there were two leaves and a single stalk on the plant. I left that stalk, although everything I read seemed to tell me to cut it off. This spring it sprouted two blossoms (yay!) and also what I believe to be a Keiki (super yay!). Here's the full plant as of today. A picture of roots that are creeping out of the pot - does this mean it's time to replant? What I believe to be a keiki. Is it ready to be potted on it's own? If so, any tips on how to do so successfully? Shan, welcome to the forum. Congratulations on bringing the plant back to a healthy condition. It looks great. 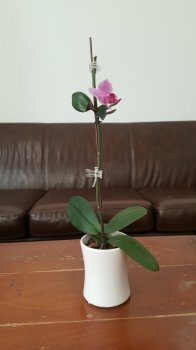 There are people here on the forum that know a lot more about Phalaenopsis than I do but this post may be a good place to start. 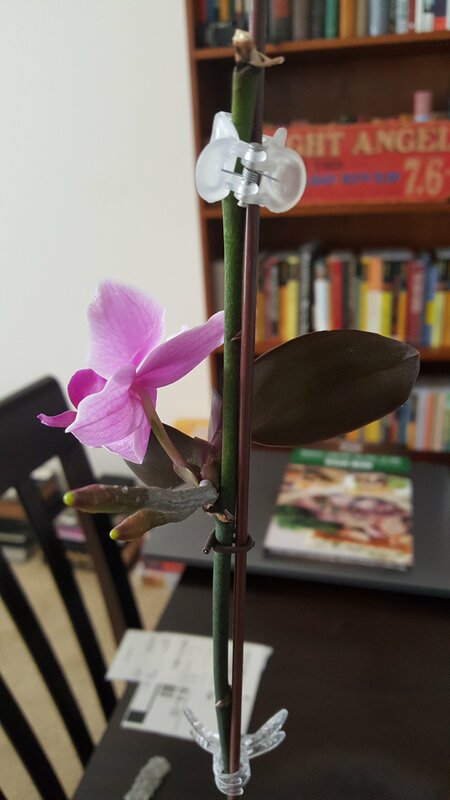 New to orchids? Read this. Your plant has good color and the leaves and roots look plump so I would say you are keeping it in appropriate light and are giving it adequate water. My primary advice is to repot when it has finished flowering. I would recommend using orchid bark which you can get at garden centers and "big box" stores. Keep it in a smallish pot similar to the size it is in, with good drainage holes on the bottom. When you repot remove the bloom spike and at that time you can pot the keiki up separately in an appropriate size pot. The roots coming out of the pot is very normal for Phalaenopsis. When you repot if there are plenty of healthy roots down in the medium it is fine to leave these air roots above the medium like that. Thanks so much, Kelly! I appreciate the link and the advice. I'll hold out until it's finished flowering. I'm amazed at how long the blooms stay on the plant! While I'll admit it's hard to tell from the photo, to me, that potting medium looks a bit "iffy". I recommend pulling the entire root mass and medium from the pot to check the condition of the roots, as well as the medium deep down. If they are starting to suffocate and die - or will be reasonably expected to do so in the next while - then I'd repot now, risking the blossoms rather than the entire plant. I'll also add that a keiki is ready to remove when it has decent leaves, and about 4" of total root length, whether that be one root, four inches long, or four at one inch each, etc. Thanks for your thoughts, Ray! So, if I understand correctly, the only reason to wait for the plant to be finished flowering is to enjoy the flowers? It doesn't have anything to do with the plant being at the appropriate stage for re-potting? I am anxious to repot, so I may just go ahead and do so. I am nervous that putting it in a new pot, with new soil and a new watering method is a lot to change at once...also, I've never fertilized it, and that seems to be important, too. Would it make sense to introduce changes more slowly or just go with the big bang approach? I totally agree with everything Ray said. I was reluctant to suggest that you pot it now because you might be afraid of losing the flower. Making the changes you mentioned above all at once shouldn't be a problem. I have repotted a Phal in full bloom without it affecting the flowers. However, if it was my plant, I would repot, remove the bloom spike and pot the keiki all at the same time (now). As a general rule (at least in my opinion)... any orchid purchased from a big box or grocery store should be repotted as soon as the existing flowers fade. 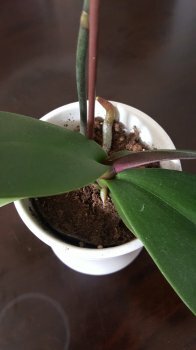 Even plants from orchid growers should be inspected for medium condition because it may have been in the pot a long time. Good luck to you and don't hesitate to ask more questions. The IDEAL time to repot a plant is just as new roots are emerging from the base of the plant, but sometimes, to avoid losing the plant, you just gotta risk it. I would not try to flush a plant in soil. That will saturate it and suffocate the roots.